Behind the Bit: Riley at 2: A lesson in "Que Cera Cera"
Riley at 2: A lesson in "Que Cera Cera"
my goal in buying a baby was/is to end up with "big, quiet horse." I told breeders that movement was not a priority but he should at least track up. I'm a dressage rider (though some of my instructors might argue this point), and my baby should grow up to be a dressage horse. It's this last point that seems to be a question mark... Que Cera Cera "Whatever will be, will be," sings an annoyingly perky Doris Day. Truer words were never spoken, except maybe "The way to make God laugh is to tell him your plans." Take a look at the Riley footage below. Note the toe flip, the horizontal frame, the nose pointing out. What does this suggest to you? To me it spells H-U-N-T-E-R.
Love the last video of that Dutch Warmblood. And to me, Riley looks very very Hunter ;) And seems like quite the relaxed mover. You're doing a great job! Riley is so lovely! He has a nice topline and I like the way he carries himself. He definitely has that perfect flat-kneed daisy cutter hunter movement. Compared to the other videos, he lacks the lightness in front that some of the other horses have. He also doesn't have a lot of knee and hock action. 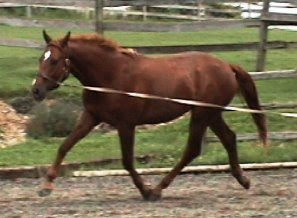 However, that may be because some of the horses in other videos are at liberty - my filly will pretend she's an Arab when she's at liberty, and then act like a typical dull QH once she's back on the leadrope. Either way, I think he is a beautiful horse, and is going to be a great athlete. Does he have any hunter/jumper bloodlines? He has rubenstein/donnerhall bloodlines, and both seem to have hunter/jumper offspring. His half-sister is competing with great success at Wellington -- I'm told she sold for a midrange six digit number. His grandma scored 10s for jumping ability and technique, she's in some elite jumper program for hanoverians. His dad is more of a dressage sire, but he's young enuf that his kids are just now coming under saddle. So it's hard to tell. Wow, it does sound like he has some strong jumping lines, even if his sire is focused more on dressage. He could just turn out to be extraordinarily versatile, which imho is an excellent thing indeed. It'll be an interesting couple of years coming up. I don't want to get too caught up in what he will or won't be -- just want him to be sound. What's amazing is how often bloodlines that are a sure bet don't amount to much. Donnerhall's father never produced one other decent sire, from what I hear. I'll have to track down the article that talks about this. I think you're having a case of young horse anxiety. I've seen it before. IMO, for a dressage horse, all you need to ask yourself, is "Does he move rhythmically?" Anything on top of that is just gravy. I've done a lot of watching of dressage, and at the highest levels, there are horses with all kinds of movement, from the flat kneed Piccolino, to the flamboyant Briar, to the incredibly Baroque Invasor. From what I've seen, the R-Line horses tend to have flatter movement than what's currently in vogue, but they still excel in the dressage ring. I'll take Riley! He might have flatter action, but he's not a leg mover like some of the other youngsters. The other 2 y.o.s look less mature than he does. I think he is very nicely balanced. The Rubinsteins are known for not developing their trot until they are older. Rubinstein himself was rejected at his stallion approvals as a 3 year old. I have a 2 year old De Laurentis also, and when she's relaxed and jogging around she also has very huntery movement, but if she gets a little excited then her trot suddenly has tons of lift and suspension. It will be interesting to see how their gaits develop with age and training.